​People have many kinds of identities: (1) what they identify with, giving them a sense of belonging, (2) what influences their behavior, consciously or unconsciously, (3) what society imposes upon them. and (4) what they voluntarily choose. 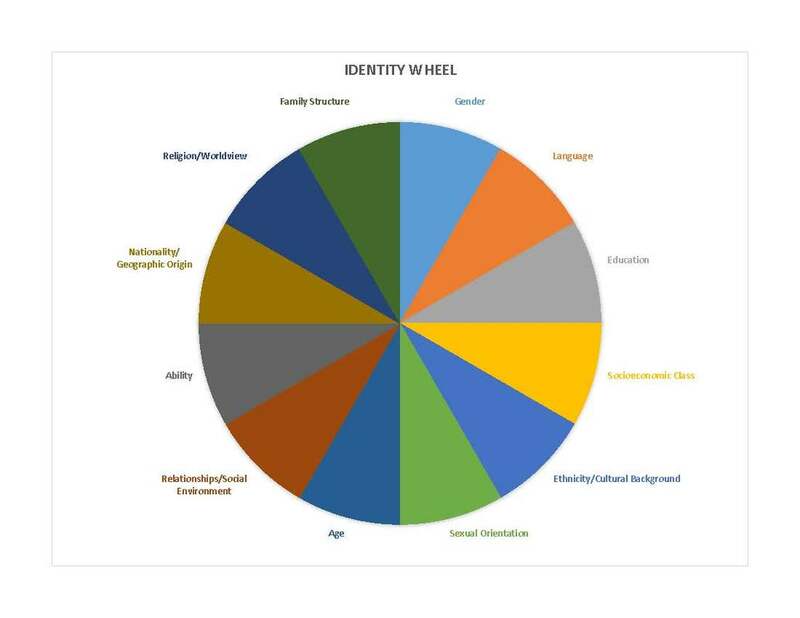 The wheel below can be helpful in discerning the constituent parts of these kinds of identity. It helps make the point that "religious identity" is one of many factors, inevitably influenced by other identities. The religiously unaffiliated will not have a specific religious identity, although religion may "influence" their behavior in an unconscious way, both positively and negatively. In the case of the religiously affiliated, the size of the religious identity may be large or small, compared to their other identities. A person may say that she is "Christian," but the other identities may carry more influence in her life than her Christian identity. Also the identities can inform one another and flow though them. A woman may be a "feminist Muslim," in which case her gender will influence her understanding of being a Muslim, and the other way around. Equally important, the identities are almost always in process, changing over time. There are very few "fixed" identities. We are always evolving in our identity, especially in our "age" identity. A person may feel like a "teenager" at one period in his life and a "middle-aged" man at another. And he might move from one location to another, such that he "was" a Texan but "now" he's a New Englander. And identities are always changing in terms of social relationships. A woman who is divorced "was" once married but is "now" single. Amid the changes a person naturally looks for something that remains relatively constant even as she changes. For some people, religion forms the constancy. An interfaith identity is an identity that is religiously affiliated and influenced by more than one religious tradition. She may be "primarily" Christian but also influenced by Judaism, or "primarily" Jewish but also influenced by Buddhism. Or she may be equally influenced by one or several religious traditions: multiple or triple religious belonging. Always her interfaith identity will be shaped by other factors: gender, age, education, socio-economic status, etc. No identity is an island unto itself. No one is purely Christian or purely Jewish or purely Buddhist. As Whitehead puts it, we always "many becoming one," with the many retaining their unique influence in our lives.